Sickening violence is only acceptable when aimed at the working class. When Menace II Society, The Hughes Brothers' violent and blisteringly real portrait of life on the streets of L.A. in the late 80s, was released in 1992, it was at least partially intended as a response to John Singleton's Boyz 'N' The Hood, which Allen and Albert Hughes thought presented too sanitised and false an image of that life than the one that they knew. To really hammer the point home, the film's tagline read, "This is how it really is." Given its hysterical and reactionary worldview, Harry Brown could easily have been given the tagline, "This is how you think it is", with the 'you' clearly referring to the sort of people who will take it as a verite dissection of societal decay in modern day Britain. 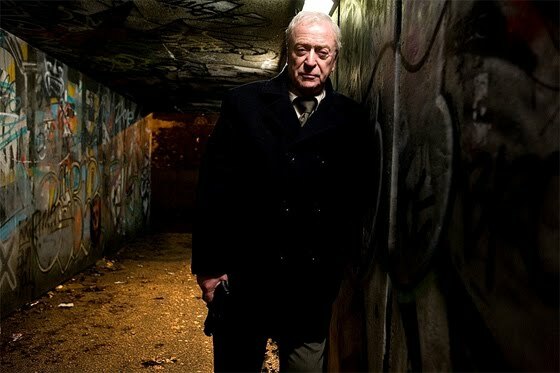 In a decaying, forgotten council estate in London lives Harry Brown (Michael Caine), an old man quietly living out his twilight years trying not to cause any trouble. Despite being a former member of the marines, Harry is too afraid to use the underpass near his home for fear of being attacked by the local youths. His friend Leonard (David Bradley) isn't going to take it anymore, though, and when he is killed trying to take the fight to them, and after the police - represented by the bird-boned Emily Mortimer - prove ineffective, Harry takes to avenging his friend's death, by any means necessary. I have some serious issues with the politics of Harry Brown and I've been trying to think of a way to review it that takes them out of the equation. I want to do this because, despite what I may think about its message and vision of the world, I can appreciate that it is a well made vigilante film with a commanding central performance by Michael Caine, an actor whose rarely less than watchable and can greatly improve pretty much any film he's in, and with some pretty effective moments of violent retribution, but that it also has some clear flaws that I didn't want to get subsumed into my other concerns. The more I thought about it, I came to realise that the films narrative and character weaknesses stem directly from its politics. The two sets of problems are inseparable. Harry Brown is a vigilante film that sides completely with the vigilante. Harry commits several rather brutal acts of violence against the boys who killed his friend, taking a definite eye for an eye approach to justice, but at no point does Harry - and, by the extension, the film-makers - question whether or not his actions are just. Likewise, the film never goes out of its way to suggest that the police, ineffective though they might be, are better suited to mete out justice, or that crime can be dealt with other than stabbing or shooting people. The best vigilante films at least make an attempt to ask moral questions whilst also satisfying the audience's bloodlust, but Harry Brown is content to sit back and watch Harry kill indiscriminately without even bothering to tackle the moral implications of his actions. Harry Brown also displays a clear contempt for every other character in its world by showing no interest in trying to make the cartoonish thugs that Harry dispatches into anything other than ridiculous stereotypes. The film opens with footage shot on mobile phones of assorted young people taking drugs and, in a sequence that is so exploitative it walks a fine line between hilarious and horrific, shooting a young mother in the head before getting run over by a truck. The film continues in much the same vein, and the lack of any attempt to give the antagonists any personality - aside from making some, such as a pair of drug dealers who wouldn't be out of place in Reefer Madness, more evil than others - or a semblance of humanity makes it all too easy for Harry to kill them, yet impossible to care about anything else happening in the film. It's a really unpleasant vision of the world that makes Harry's eventual triumph feel rather hopeless; why bother fighting if the whole world is so awful? Shane Meadows tackled the vigilante film with much greater skill and bravery in Dead Man's Shoes. Meadows was able to deliver visceral, satisfying and effective violence which had weight because Paddy Considine's victims felt like real people. Horrible people capable of true, everyday cruelty, but people nonetheless, and the question of whether they deserved to die gave the film a lot of its power. There are no real stakes here, it's just a bunch of caricatures getting killed by a psychopath. Having said all this, Harry Brown is a well-shot, well-made film. On a technical level, it's very impressive for a debut feature, and the actors make the most of their sketchily drawn roles. The essential cowardice of the film in its unwillingness to ask tough questions about the actions of its character prevents it from rising above being just a Death Wish clone.